Largemouth bass like to hunker back under the weeds to escape the summer sun. Under the canopy, they enjoy a comfortable, secure world, often as not with plenty to eat. In the morning and again towards evening, a bass angler may get away with fishing over the weeds with floating and skimming baits. But during the bright part of the day, it is probably going to be necessary to somehow get a bait down under the surface weeds to where the bass are holding. A switch to braided line can help. Many anglers don’t use braided line because it seems too visible in the water. Yet 10-pound test, typically my first choice with a spinning reel, has the same diameter as 2-pound-test monofilament. The 50-pound test I sometimes put on the baitcaster has the same diameter as 10-pound mono. This thin diameter helps reduce the underwater visibility of the line, and shadows under the weeds also help to hide the camo braids. It can be difficult to tie, cut and otherwise work with a tough braided line. But it acts like a knife in the weeds, slicing through stalks and stems that would surely ball up on more forgiving monofilament or copolymer line. A hooked bass’ instinct is to swim farther back in the weeds, and when using braided line, I can often follow a hooked bass by watching the weeds that rise as the line slices through. When a big bass wraps around a cluster of stems that the braid can’t cut, the tough line holds the fish while I boat in and attempt a landing. A 5-pounder I hooked just inside a weed line took a narrow lane in the lilies to dig in even farther. No way was I going to pull this fish back out, so I let the braid do its thing and slowly approached with the weed-cutting trolling motor. About 20 feet into the pad field, I was able to reach down in the thick stuff and pull out my catch, a very nice northern bass I most certainly would not have landed without the braided line. The locked pools of the upper Mississippi River include back bays that can be so choked with summer weeds it is difficult to just get a boat back in there, let alone fish. But that’s where the bass are often hiding, despite water temperatures in the upper 80s. Tossing jigs into this greenery would be nearly impossible without the cutting power of braided line. Of course, thick weeds are no place for treble hooks, let alone lures with double sets of trebles. A soft plastic bait can be rigged more or less weedless by simply burying the single point of a bass hook back in the bait, and there are a couple of ways to do this. You can “skin hook” a soft plastic bait with the point of the hook just barely under the plastic skin. When fishing the relatively open water under lily pads, skin hooking is usually fine because the bait is not in constant contact with the stalks. But when fishing in truly stringy grass, the constant pull of vegetation against plastic will cause the hook point to emerge and snag the grass. Here, it’s best to really bury the point in the bait. Some think it’s hard to set the hook if the point is buried deeply, and it does take more of a pull to get the hook through the plastic and into the fish. A little trick can help. As you thread the hook back into the bait, purposely push the point all of the way through and break the skin. Now pull the point back into the bait. This “pilot hole” will let the hook slide more easily back through the plastic when a bass takes the bait. The thicker the plastic bait or trailer, the more helpful this can be. Matt Bichanich, of the Uncle Josh Bait Company, has a trick for rigging the pork on the back of a jig and pig. Instead of pushing the hook point into the fat section of the pork, he places the point in the high end then runs the pork trailer down the shaft of the hook, pushing the pork to just behind the collar of the jig head. The pork is held in place by a small plastic collar, like the ones used for trailer hooks on spinnerbaits. Rigged this way, the flaps of the pork help protect the hook point as it comes through the weeds. I’ve also found that a 3- or 4-inch sinkworm, like the Yum Dinger, is an excellent bait along the edges of those thick Mississippi River weed beds. I believe it serves as a kind of drowned dragon or damselfly imitation, a natural prey for summer bass. Despite the bait’s thin body, it’s a good idea to keep the point close to the soft-plastic surface because strikes are usually nothing more than quick swipes, and you have to react quickly to set the hook. I don’t throw this bait back in the weeds, preferring to work a skin-hooked bait along the weeds’ outer rim. When I want to fish under the weeds, my first choice is a jig with a soft plastic or pork trailer, and rule of thumb is to go heavy. I prefer 1/2-, 3/4- and even 1-ounce jigs. The weight helps the bait break down through the surface weeds. Traditional bass-type jigs work, and the Sizmic Okeechobee Jig, by Uncle Josh, offers a slightly different presentation option. 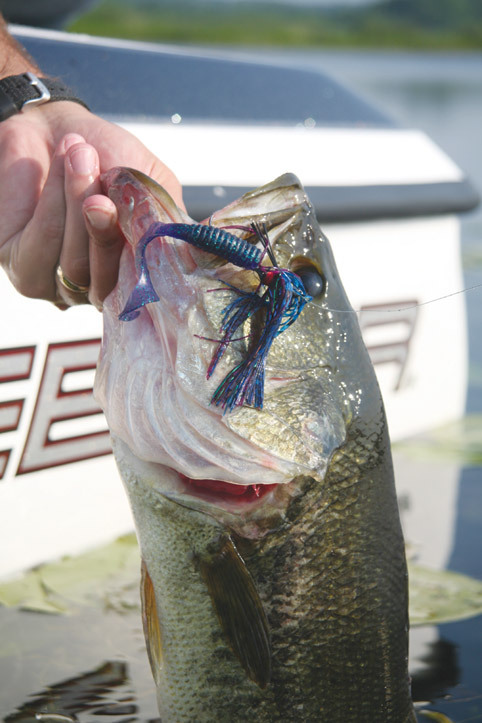 The Okeechobee jig has a bullet weight clipped on the bend of the hook. The hook shaft stands straight up, and the trailing bait hangs vertically on the shaft, slightly off bottom. Placing the weight on the hook bend this way also helps the bait penetrate the thickest weeds while keeping the soft trailer swimming behind. With either type of jig, I usually flip or pitch the bait into the weeds and then let it drop through to bottom on a slightly tight line. I leave the bait where it lands on the bottom, jiggling it in place for a few seconds. Strikes often occur during this jiggle. If I don’t get a strike, I lift the bait until it is just under the weeds and then jiggle it again for a few seconds. This near-surface jiggling action can be particularly effective when bass are looking up for prey in the surface weeds, and I may repeat this drop and jiggle, raise and jiggle action two or three times before retrieving a bait and pitching it to a new location. An area just south of the Wisconsin-Iowa bridge at Prairie du Chien has pads so tight a frog may cross a bed without touching water, and this is an ideal location for the presentation. I look for the telltale weed-waving sign of a bass feeding in the thick stuff and try to drop the jig and trailer next to the edges of the pads where the most activity is occurring, If the bass doesn’t take the bait on the fall or on the bottom jiggle, I raise the rod tip to lift the jig to just under the canopy and then wiggle it for a few seconds. If nothing hits, I let the jig fall back to bottom. The strike comes most often as I let the jig fall. When fishing under weeds this way, it’s usually best to work a bait more in a vertical rather than a horizontal fashion. But where the stalks and stems are not overly thick, you may make a short cast and then retrieve across and through the weeds. Be sure to jiggle the bait every time you contact a weedy clump, and also occasionally rip the lure loose and then let it fall to the bottom. This ripping action sometimes triggers jarring strikes. But in truly dense vegetation, the best approach is to pick a likely spot and then work it with a series of vertical lifts and drops. Quietly approach the target area by either letting the wind push the boat or by using a pole to get back into the weeds. Refrain from using the trolling motor. Now use a pendulum cast to pitch the heavy jig up so it will descend nearly vertically, and don’t pull the bait across bottom but rather lift and lower it in place. If nothing takes the bait, pull it and find another nearby target where you can lower the bait back on a mostly straight line. Working under the weeds this way may not be as easy as just skimming a bait over the top, but once you start catching the big bass that lurk under the mats, you’ll be happy to put up with the trouble.